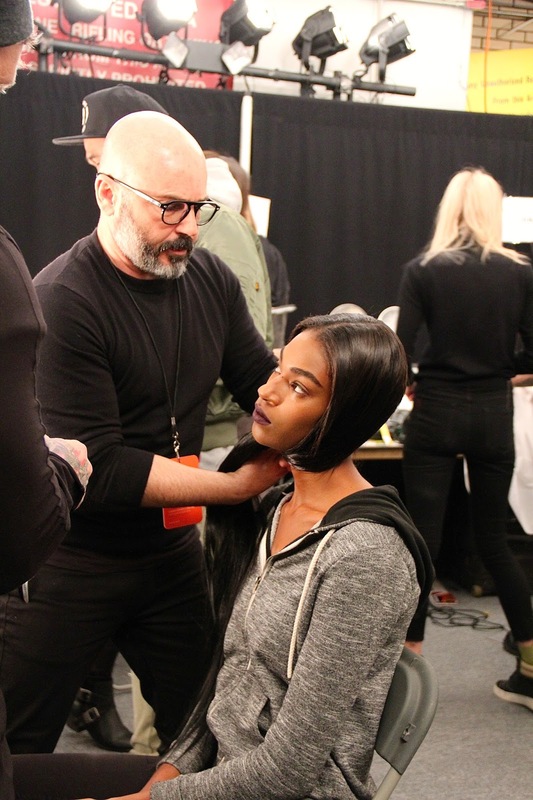 Backstage at New York Fashion Week, for Nicholas K Fall/Winter 2016, Lead Stylist for Macadamia Professional, Giannandrea created the hair look for the show: The Under-Chin Side Knot. 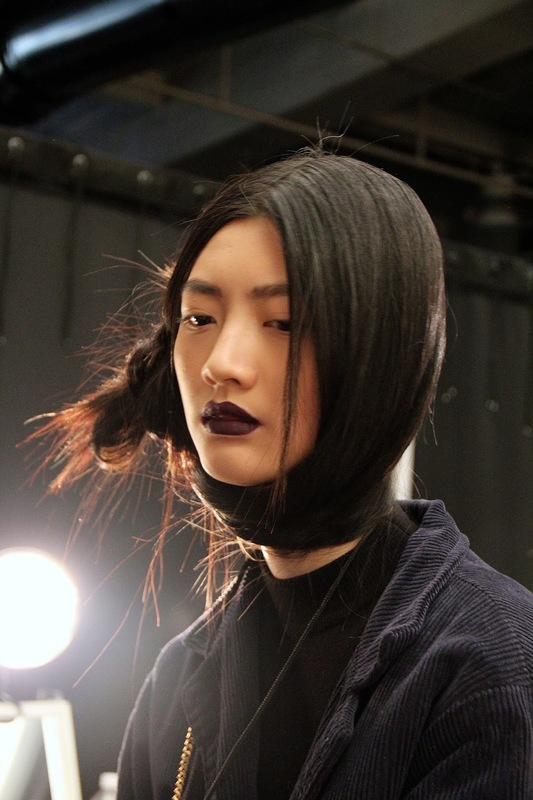 This unique look included a side part half chignon under the chin, with an abstract wood hair stick. 1. Starting with wet hair, apply one pump of Macadamia Professional Blow Dry Lotion ($24) from the mid-lengths to ends and blow-dry hair straight. 2. Use a flat iron on small sections to seal the straight hair. 3. Create a sharp center part on the crown only and brush hair down into two loose sections on each side of the head, in front of each shoulder. 4. Run a quarter-sized amount of Macadamia Professional Nourishing Moisture Oil Treatment ($39.95) from mid-lengths to ends. 5. Take the hair section on the left side and gently place it across the neck to meet just below the right ear in a ponytail. Secure the ponytail with a hair tie. 6. Wrap an extension matching the hair color around the hair tie to achieve more length or volume if desired. 7. Twist the hair into a wrapped bun and let the end of the hair stick out 7 inches. Secure the bun with bobby-pins. 8. Spray Macadamia Professional Flex Hold Shaping Spray ($25) over all of the hair and smooth any flyaways. To get the Night Shade look, Sarah Lucero for stila Cosmetics applied rich Aubergine lips paired with accentuated dark brows, flawless finish natural skin and eyes. She also used Beauty Blender's new liner.designer to guide lip liner. The three different edges is also great for creating multiple eye looks. 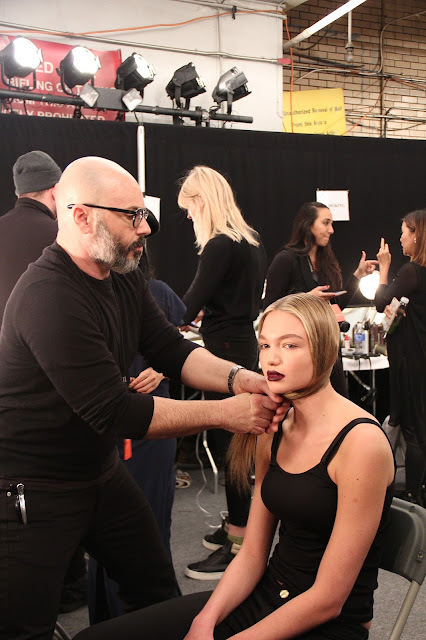 Elle Gerstein for Dermelect created the Nightshade nail look for the show, which includes gloss polish with black velvet dipped tips.